From the brew day last March, finally, here are the tasting notes to my Big Oatmeal Stout (the link to the brew day is here). This one came out great and has been folding up well with age. Coming in at 6% ABV, this beer isn’t that strong across the stout spectrum (Imperial stout, for example), but big compared to the Oatmeal Stout style (by BJCP standards say 4.2-5.9% ABV). Additionally, I was interested to see if the Fuller’s Yeast strain, Wyeast 1968, would show any higher fermentation character when competing with all those roasted malts. Overall, this beer ended up tasty with the recipe and review below. Pouring into a Schlafly snifter glass, this beer has an inky black appearance with a tan head. The aroma is now refined, mellow light fruit aroma (on the pear spectrum) with hints of toast and cocoa. Similar to the aroma, this stout has noticeable fruit character along with a bready, coffee-like finish. Additionally, there is noticeable bitterness in the finish, likely from the generous doses of roasted malts enhancing the fading hop bitterness, which kept this brew from having a sweet finish. The near one-year old body was on the medium side, but some of the oat-based mouthfeel was presence. Also, for some reason, this one over-carbed a bit, so I de-gassed for a while, which ended up great as the additional de-gassing allowed for the stout to warm up, showing more of those coffee/chocolate roasted character. 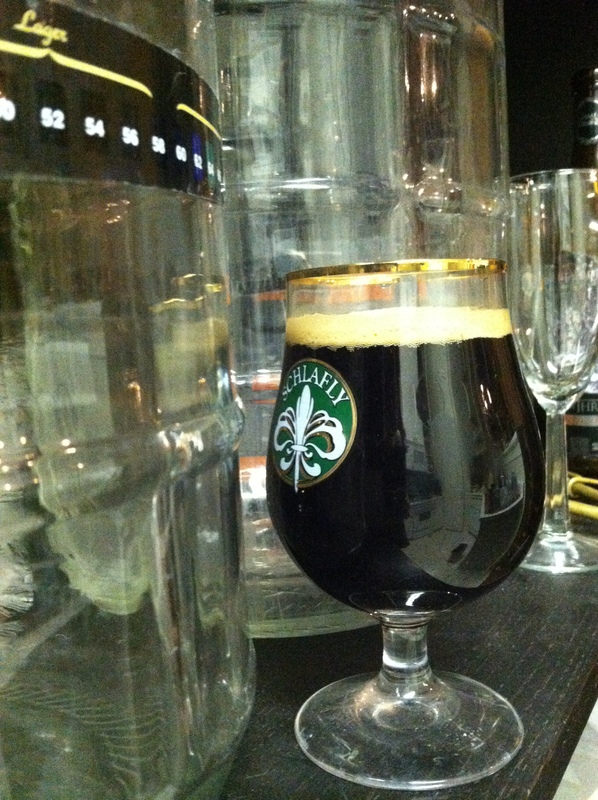 Overall, I like this Oatmeal stout recipe, which I found to be on the drier side of the style. Also, I was surprised that the fruit character of the Fuller yeast strain was noticeable over all the dark malts, finding it added hints of pear to the brew. If I were to brew another big Oatmeal stout in the future, I would likely try a different yeast strain, which expressed the roasted malts even more, like an Irish ale yeast strain, Wyeast 1084, for those who like black coffee or espresso. Also, I would replace flaked oats with Simpson’s Golden Naked Oats, as I used in the Naked Blonde Ale brew day and tasting, which added a berry/nut flavor.